The asteroid Juno will be in opposition to the Sun this week on January 29, between Jupiter and Procyon. Have you ever seen an asteroid? An asteroid is a small rock in space, smaller than a planet yet larger than a meteoroid, the rocks which cause meteors to flash across the night sky. While we know of millions of asteroids today, they were totally unknown to astronomers until 17th century astronomer Giuseppe Piazzi spotted Ceres, the largest and first known asteroid, in the early hours of New Year's Day in 1801. Over the next six years, three more asteroids were discovered, but it would be another 38 years before another would be found. It wasn't until photography began to be used for astronomy that the huge number of these tiny bodies became clear. Juno is quite a small object, and it is also quite far away. Currently, the asteroid is about 128 million miles (200 million km) from Earth. Juno's brightness is rated at a magnitude 7.8 on the scale used by astronomers to measure how bright an object in space is. That means it is beyond the ability of the unaided eye, so you will need binoculars to see it. Fortunately, there are some brighter guides to spotting Juno. The asteroid can currently be found about halfway between the bright planet Jupiter (now visible in the constellation Leo) and the bright star Procyon in the constellation Canis Minor. 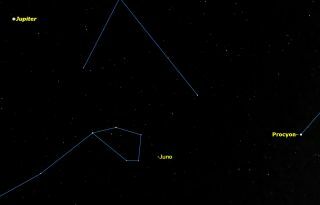 Juno is also very close to the "head"of the constellation Hydra, the Sea Snake. This chart shows the movement of Juno over the next two weeks. With binoculars, use Jupiter and Procyon to put you in the area of the head of Hydra, a quite obvious pentagon of 4th magnitude stars. Then use the detailed chart to pinpoint Juno's location with respect to Delta and Sigma Hydrae on the night you are observing. Notice that Juno is moving quite rapidly across the sky. In fact, if you observe it for more than a few minutes with a telescope you can actually see it move against the background stars.